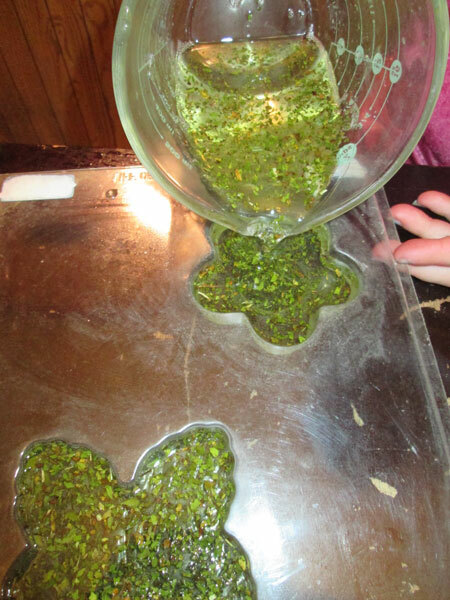 Making your own glycerin soap is very easy to do. So easy, in fact, that all of this soap was made by my 8 year old with minimal assistance from me. 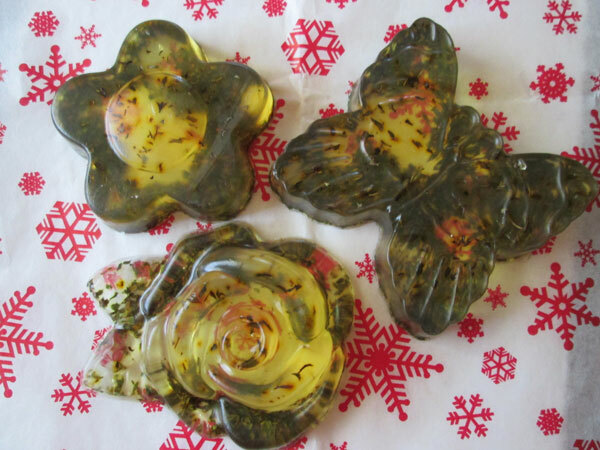 My daughter gave homemade glycerin soap as Christmas presents to her grandparents, godparents, dad and brother. 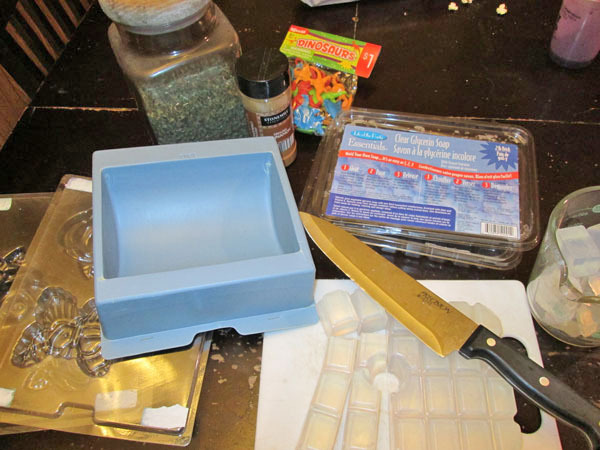 I had soap molds already, so I didn’t need to buy any to make these and we used food products we had in our home and essential oils I already had. I have seen posts where people greased muffin tins or used silicone muffin molds to make their soap in. Our only cost was the 2 pound container of glycerin soap base that we used a 50% off coupon for Joann’s to bring down that cost, otherwise the container was normally $9.99. The instruction for how to make the soap are simple: It is just melting the glycerin cubes in the microwave and then stirring in any other ingredients you want. Directions: Place glycerin in a microwave safe container and cook glycerin on high for 30 seconds. Stir and return to the microwave for 30 more seconds. Stir in mint leaves. Pour in to molds. Let the soap cool and harden. Remove the soap from the molds. Directions: Place glycerin in a microwave safe container and cook glycerin on high for 30 seconds. Stir and return to the microwave for 30 more seconds. Stir in cinnamon. Pour in to molds. Let the soap cool and harden. Remove the soap from the molds. Directions: Place glycerin in a microwave safe container and cook glycerin on high for 30 seconds. Stir and return to the microwave for 30 more seconds. 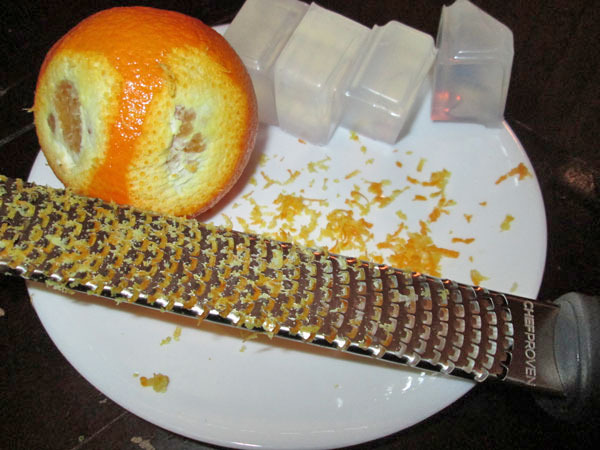 Stir in orange zest and essential oil. Pour in to molds. Place in toys, if desired. Let the soap cool and harden. Remove the soap from the molds. 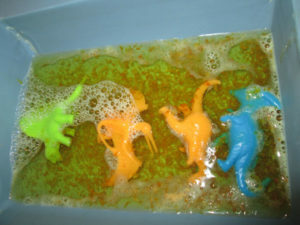 My daughter was making the sweet orange soaps with her brother in mind and we thought it would be fun to put some cheap little dinosaurs (he’s a huge dinosaur fan!) inside that will eventually come loose and out as he uses his soap. The toys did rise to the top, so it won’t take long for him to be able to play with them. Have you ever made your own glycerin soap? What scents do you like to use? That does seem rather simple to make and each bar could be personalized for whoever you are gifting it to. My microwave just broke (sigh)-I wonder if you can somehow melt the glycerin on the stove-a double boiler maybe? Yes, it would works just fine to use a double boiler. It will just take a little longer to do, but it’s still quick and easy. Very cool, I have never heard of a recipe for making soaps… the designs are beautiful!!! 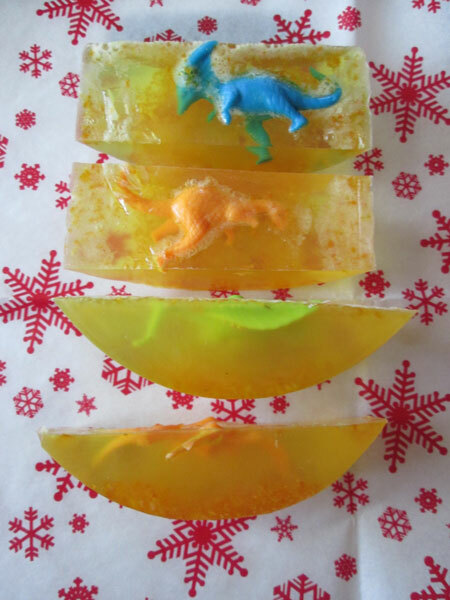 That’s so cute to put dinosaurs in the soap, and I love that your 8 year old helped! How neat!! My daughter would get so into this. Great gift idea, especially if they were made into a little spa basket or something for grandmothers. Love this thanks! I love making soap! It is so much fun! I love making soap! 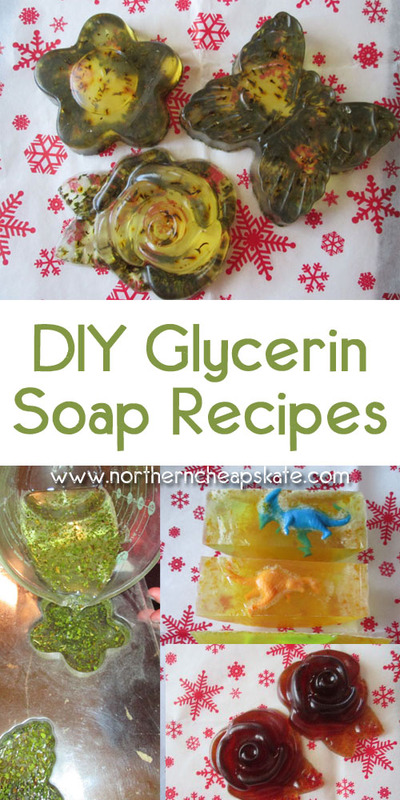 I have never tried glycerin before- I’m totally going to try it now! I love how cute yours came out! These are so pretty and would be perfect for a guest bathroom. I like that you can put the shapes in there. This would be so fun for the kids to get involved in making. 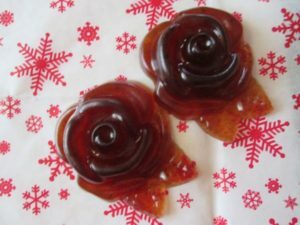 Love the Cinnamon Glycerin Soap Recipe- so pretty and I bet it smells great! Also, love the idea of adding a toy to the soap. Fun! I bet the peppermint one smells so lovely and refreshing!! Peppermint and cinnamon? You do know I can’t resist those scents, right? These are beautiful and I want to try this so much! I love that you are sharing this. I used to work for a store in high school that sold soaps like this and I would love to make my own one day.